Kalle Nio is an award-winning magician and visual artist from Helsinki in Finland. His stage work combines historical stage magic techniques with contemporary video projections. In 2000, he won third prize at FISM in the invention category and the same year co-founded WHS – a collective producing new circus and visual theatre – with juggler Ville Walo. WHS has played a key role in the rise of contemporary circus in Finland and has been seen internationally. Its show Pinta was at Jacksons Lane in London during CircusFest 2016. Kalle is also one of the founders of Teatteri Union, an art-house cinema and performing arts venue in Helsinki. His works as a visual artist involve the collision of magic, cinema and the human body. 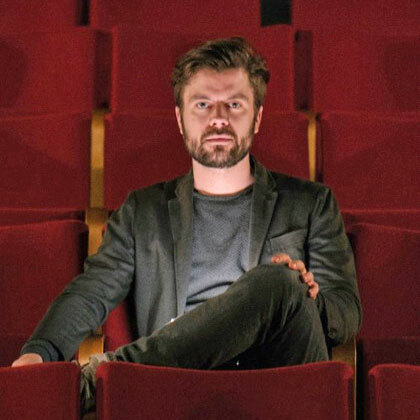 He now appears with Vera Selene Tegelman in his award-winning production Lähtö, which he also directs. The show has its UK premiere at the Platform Theatre in London and runs from 10-13 January 2018 during the 41st London International Mime Festival. Kalle takes a break from “testing some scenes for a new show” at Teatteri Union to chat to Liz Arratoon. Do you come from a showbusiness background? Kalle Nio: No… well, sort of. There isn’t any in my family but I started to do magic when I was a really young child, like maybe most magicians. I had my first performances when I was five years old and then never stopped doing it. So I’ve been doing magic all my life, basically. Many magicians start out with a little kit, such as a Paul Daniels’ set. How did you learn? Yes, like that. Exactly the same old story. I got a magic kit from a toy store and then I started to learn from books. Then I went to some youth circus schools and things like that, but I don’t have any official circus training; I’m really self taught. Paul Daniels was really big in Finland as well when I was kid and I watched a lot of his shows. What made you start it so young? I suppose I saw some magicians on TV and stuff like that but it was something that always felt like my thing. It’s curious because when I started it was just so natural for me; ‘OK, I will do that‘. Then I did magic almost professionally from when I was 14 because I won the youth championships of magic in Finland and that led me to perform on some TV shows that were really popular. After that I had so many possibilities to perform everywhere it kind of became my profession. It was a very natural thing to do.